Traveling with oxygen? Click here for advice from YourLungHealth.org. Up to 8 hours of compressed oxygen each fill. Order online or call to place your order by phone - 866-737-7247. Our smallest, lightest weight travel oxygen system weighs 3 lbs. and lasts 3 hours (at a flow equivalent of 2 LPM). Comes with 4 CF cylinder, adjustable regulator, Oxy-Plus conserving nasal cannula, and medium concentration oxygen mask. Choose either fanny pack, shoulder bag or back pack. 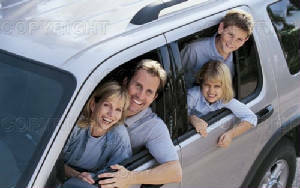 For more information, click picture. 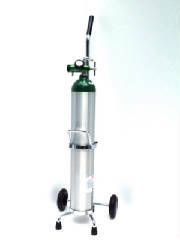 Our popular mid-sized travel oxygen system weighs just over 4 lbs. and lasts 5 hours (at a flow equivalent of 2 LPM). System includes 6 cu.ft cylinder, adjustable regulator, Oxy-Plus conserving nasal cannula and medium concentration oxygen mask. Comes with your choice of fanny pack, shoulder bag, or backpack. Our longest lasting travel oxygen system weighs just over 5 lbs. and lasts 8 hours(at a flow equivalent of 2 LPM). Comes with 9 CF cylinder, adjustable regulator, Oxy-Plus conserving nasal cannula, and medium concentration oxygen mask. Choose either fanny pack, back pack, or padded shoulder bag. Optional training DVD teaches the use and care of the oxygen system and is available in our store catalog. Our portable oxygen system with cart weighs just over 9 lbs. and lasts over 7 hours (at a flow equivalent of 2 LPM). Comes with 15 CF cylinder, adjustable regulator, standard nasal cannula, medium concentration oxygen mask and push cart. 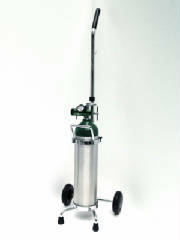 Our portable oxygen system with cart weighs just over 11 lbs. and lasts over 11 hours (at a flow equivalent of 2 LPM). Comes with 24 CF cylinder, adjustable regulator, standard nasal cannula, medium concentration oxygen mask and push cart. 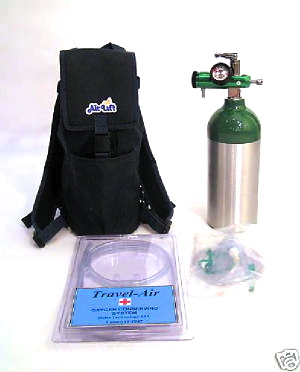 Travel-Air - Some portable oxygen systems if used exclusively for medical purposes require a prescription. Please call to discuss if a prescription is needed, or fax a copy of your prescription. 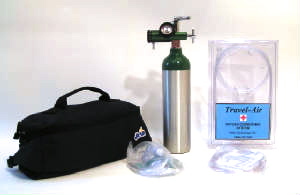 Res-Q-Air TM Portable Emergency Oxygen Systems meet or exceed FDA requirements for emergency oxygen and do not require a prescription. Instructional DVD is included with every emergency system. Training Certificate is provided with Instructional program.